odys for your iPod (2005) is an extension of the odys series (2001-2004). the odys series consists of six short digital video poems / monologues for small screen viewing in an intimate gallery space. By stuttering between odys' actions and words, listeners construct his person. As he attempts to re-member, bringing the past back to his body and calling it his own, listeners attempt to piece together a story for themselves. Viewers are encouraged to re-visit and jump over juxtaposed media, and create a shifting collage of, and in response to, his person. 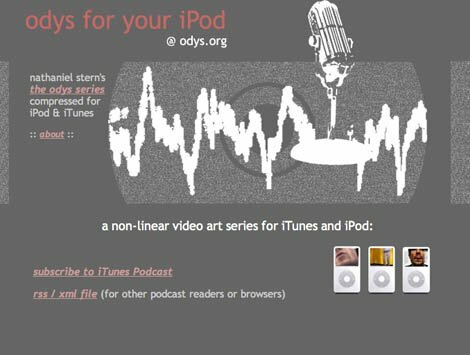 odys for your iPod encourages viewers to download all six of the newly optimized video art pieces from odys.org, and into iTunes and their iPods. It allows for an even more intimate and physical relationship with his character, as well as a continually growing connection with each vignette. odys' name comes from The Odyssey; he is the traveler, the seeker of home (Ithaca). Contrary to both Odysseus and hektor ( see http://hektor.net ), odys is an unconvincing liar and horrible storyteller. His failed attempts to speak the traumatic past are often mistaken for nonsense. Ironically, odys’ poor endeavors at communication can now be largely consumed by a take-away transmission: online at odys.org. odys' language of utterances is about the "spaces between." The space between words, between articulation and inarticulation, between Troy and Ithaca, between judgment and responsibility, and between speaker and listener.